Mainland Thailand is a popular tourist destination that’s home to historic sites, modern cities and cultural variety. But a trip to Thailand doesn’t have to stop at the mainland. Thailand is also a nation rich in tropical islands that add variety to any vacation in one of the most popular Southeast Asian countries. The second most popular island in Thailand is a tropical island called Ko Samui. Known simply as Samui to the island’s inhabitants, it’s defined by the white sands and coral reefs we most often associate with the Caribbean. Most importantly, the rainy season in Samui lasts for only one month (November) and the rest of the year is relatively dry. If you’re looking for a secluded island getaway, this isn’t the destination for you. The island has a population of 50,000 but while this may be a problem for some travelers, the population can be an asset to any vacation. Vacationers can enjoy the many festivals hosted by the island including a regatta, a tennis open and a five-day Fisherman’s Village Festival. Many of the festivals involve Samui’s unique cuisine based on a fusion of Malaysian, Indian and Indonesian influences.This food is renowned for being extremely spicy and should be an important part of anyone’s trip to the island. Located in Surat Thani Province, Samui has an international airport that makes going to and from the island fairly easy. 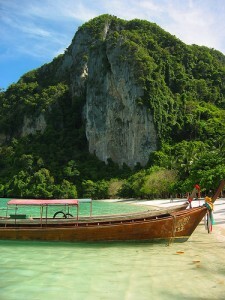 The Phi Phi Islands are slightly closer to the mainland and much of their ecology is protected by National Park Status. This protection has preserved the beauty of their beaches as well as the availability of wildlife that has made the two islands perfect destinations for bird watching. The Phi Phi Islands have a slightly longer rainy season than does Samui but the fact that they’re far less populated is an attraction for many tourists. Like Samui, the Phi Phi Islands host a number of festivals of interest to tourists including the Krabi Boek Fa Andaman Festival that features water games at the beginning of the tourist season. Tourists should know that the islands haven’t totally recovered from the 2004 Tsunami but most public services are functioning again and the ecology that was such a draw to tourists before the Tsunami is still thriving in the islands’ national park. Tourists interested in Thailand’s tropical islands should also consider Ko Samet and Ko Phangan which are both less popular than Samui and offer resort style accommodations. Being less populated, they’re also ideal sites for scuba diving and snorkeling. Thailand’s tropical islands offer the same amenities and activities that can be found in the Caribbean but do so as part of a Thai vacation package. Some of the Thai tropical islands are even connected to the mainland by bridges so that there is really no excuse to avoid visiting them. You can visit them for typical tropical activities but at the end of the day it’s their unique Thai culture and cuisine that sets them apart from tropical islands the world over.